Israeli scientists have developed compounds that could be better treatments for genetic diseases than current drugs. Timor Baasov and his colleagues at the Israel Institute of Technology have improved compounds used to suppress faults in genes called nonsense mutations. 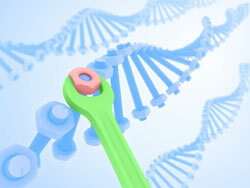 ‘Treating genetic disorders is one of the biggest challenges of modern medicine. The likelihood that suppression therapy could be used clinically is very feasible,’ says Baasov. Read the whole story in Chemistry World.